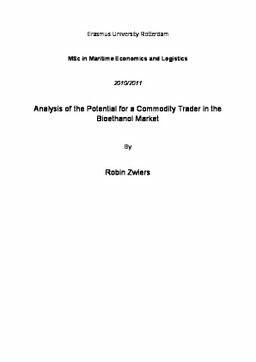 The main objective of this thesis is to assess the current ethanol market and to try to identify whether there exists a decent fit between ethanol and Transammonia, which is a commodity trader, to consider adding it as a trading product. Ethanol is produced from raw materials that are also used for producing food; resulting in a negative relation with the Food Price. This negative relation causes critics and powerful public opinions that in turn shows very high involvement of governmental institutes. Nevertheless, many governments around the world have increased, or started, mandated ethanol volumes. By implementing such programs, countries become less dependent on fossil fuels. The new mandates are resulting in an increase of the worldwide ethanol trade which is currently mainly supplied by either Brazil or the United States. Due to this worldwide trade, many market players, varying from all different sizes, are active in the ethanol market. Understanding adjacent markets and other influencing factors are crucial for these players. Influencing factors, like the price of raw materials that are used to produce ethanol, show fairly high correlation ratios with the market price of ethanol. Also the influence of the weather and the political involvement is significant for the ethanol market price and must therefore be closely monitored by any company involved in trading ethanol. For Transammonia, ethanol could provide a business opportunity and shows several interesting synergy opportunities with their existing products. Transammonia has a strong and extensive network in Europe and the United States and is therefore highly capable of combining fertilizer with ethanol trade in these regions. This trade is based on the backhaul principle and will reduce transport costs significantly. By combining UAN and ethanol trade between Europe and the United States, significant costs reductions occur. This fact and the proven expertise in trading a seaborne bulk commodity, results in high synergy effects and could finally result in higher profits. Nevertheless, Transammonia must keep in mind that there are a few barriers for trading this product. The main barriers that are applicable to Transammonia are the lack of knowledge in the product and the high involvement of governments, which can lead to uncertainty. However, if skilled and knowledgeable traders are attracted to Transammonia, ethanol could definitely be an interesting product for them to add to their portfolio.